UPDATE November 23rd 2014: I removed the download link. There’s a new version available, along with a new blog post. Working with a Remote Desktop Services deployment where User Profile Disks are used in an environment with a lot of users. During testing / acceptance stages we noticed that it could be cumbersome to translate the SID in the filename to a user account in the event where we’d need to delete the User Profile Disk for a certain user. And so Sidder was born. Sidder is a small tool (just one executable), which when run needs the folder that holds the User Profile Disks. Once selected it will parse all the filenames and translate these to NTAccount names (domain\username). It also shows the last modified date for the profile disk file. It was built on .NET Framework 4.5, so it runs natively on Windows Server 2012 and Windows Server 2012R2. Sidder will remember the last folder you selected and the column-widths in the view. I’d love to hear some feedback on this little tool. Hi. It look great, but i would be great, if you could enter a UNC-path to a share containing the UPD. Good tip. Have you tried mapping the UNC as a network-drive to see if you can use that as a workaround in the meantime? Great tool and site. Lots of very useful and wel written articles! In Sidder my UVHD template and some profiles are showing SID Resolve Error. I also don’t see the link in C:\Users to the UVHD like I used to. What might that be? I’m totally stumped and documentation is hard to find. 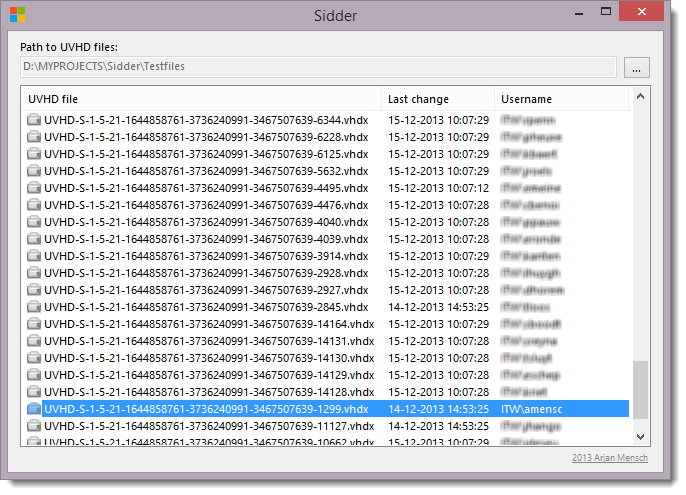 Sidder is used to resolve profile disks to Active Directory accounts. Templates and local users (like service accounts and administrator) can get a profile disk as well, but these will resolve in a SID Resolve error. This is normal since they do not have a SID in Active Directory. You cannot use Sidder for C:\users. It can only be used in a folder where UVHD-.vhdx files are located. Nice tool! What i would like to see is a refresh option and a delete option. Refresh should be easy. Delete is a possibility but I’d need to think about what to do should the VHDX still be mounted, or otherwise in use? If the VHDX is still mounted or in use you are simply not able to delete de file, this is a Windows default behavior. That I understand. But it could be some process is locking it, even if the user is logged out. I’m thinking of ways to track which process is preventing you from deleting it, in case it’s locked.. Anyway, good options, I can see the need for deletion and refresh. Just the tool i was looking for, would it be possible to export the list to CSV, TXT or excel format. I’ll put that on the feature list for the next version as well, thanks! Very useful. As mentioned before support for UNC paths would be great. Just one question. Is there any option to save/load the UVHD path automatically when the Sidder starts ip? Sidder will save the last successfully opened profiledisk folder. So you only need to select the correct folder on first-run. Yee, if You set in windows explorer “Shared with” column visible it gives same result! I’m not sure what you mean? If I open the profiledisk folder (where all the .vhdx files are) and enable the Shared With column in the view it remains empty? You have a username to sid mapping in that column? Open Windows Explorer View–>Choose details–>Select “Shared with” click Ok. this will give the usernames the UVHD shared with. i love the SIDDER. would like to see some options like right click and mount,backup,rename, exporting the list to .cvs or xls. I’ll put your remarks on the wishlist for the next version. Thank you! Very useful tool. Any eta on an update for UNC paths though? Mapping drive for now but that would make this perfect! It’s already ideal for managing an RDS 2012 farm from RDweb. I can’t give an eta, sorry. Too busy working at the moment to research new stuff for tools like these. I’ll try to fit it in sometime next month, but no promises. Is there a way to save these results to a csv or Excel file?